World debut recording. The "garden" of anything-but-normal (read: "exceptional") young lions constructs a kinetic, vividly hard-hitting a sound painting. Forms and colors rhythmicize the images, breathing ideas more than stories. 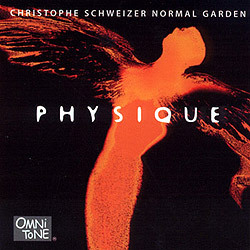 The metamorphosing and rhythmically interweaving compositions of trombonist Christophe Schweizer —at the same time abstract and sensual —are nourished by the seven musical energies of Normal Garden. From the reserve and precision of German bassist Johannes Weidenmueller to the unpredictable interventions of pianist Ethan Iverson (of Bad Plus), the Septet's sound is shaped by the flying cascades of Donny McCaslin's warm tenor saxophone, the soulful Russian evocations of trumpeter Alexander Sipiagin, the rhythmic originality of Eric Rasmussen's alto playing, and the inventiveness and spirit of legendary drummer Billy Hart. The preeminent Hart is a regular member of Normal Garden (not studio "ringer") —quite a tribute to the upward mobility of Christophe Schweizer's musicianship. Rhythmically and timbrally provocative, full of twists and turns and surprises, Normal Garden's in full bloom here. Buy Physique now at the OmniTone store. All compositions by Christophe Schweizer, Lumeen Music/SESAC. Recorded 12 May 1999 at Tedesco Studios in Paramus, NJ.